This is an old-fashioned love story for grown-ups. It’s a story about second chances jeopardized by second guesses, about ordinary days changed by an extraordinary coincidence, about two people who were not attracted to each other coming together to find what they have in common. Albert (Gandolfini) is sloppy, bumbling, overweight, divorced, set in his ways. Eva (Louis-Dreyfus) is a masseuse, also divorced, and he is one of her two new clients. She’s soon falling in love with him…until she hears from her other new client Marianne (Keener), that Albert is her former husband – and a real loser. Should Eva trust Marianne’s experiences, or her own? In the game of love, should the opinions of others trump the feelings in your heart? This movie works its way through those questions in its own quiet, unhurried way with performances driven by small gestures, small talk and real chemistry between two broken and likeable people. There are some laugh-out-loud moments, but there are plenty of smiles also. Each scene is only as long as it needs to be; the story unfolds at a pace that feels unforced, casual. We slip into the characters’ lives easily, comfortably; and if it seems that we know these people – well, we’re always more interested in what happens to people we know. 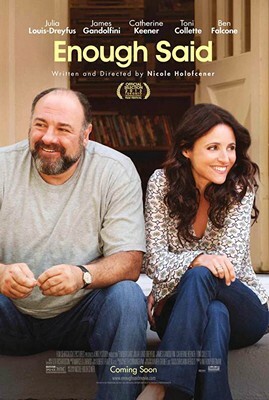 And Gandolfini and Louis-Dreyfus make what happens to Albert and Eva something we very much want to know.